At least thirty-five languages indigenous to South Africa are spoken in the Republic, ten of which are official languages of South Africa: Afrikaans, IsiNdebele, Sepedi, SeSotho sa Borwa, SiSwati, XiTsonga, SeTswana, TshiVenḓa, IsiXhosa, and IsiZulu. South African English is also an official language, and is the de facto primary language used in parliamentary and state discourse, though all official languages are equal in legal status, and unofficial languages are protected under the Constitution of South Africa, though few are mentioned by any name. South African Sign Language has legal recognition but is not an official langauge, despite a campaign and parliamentary recommendation for it to be declared one. Unofficial languages include SiPhuthi, SiHlubi, SiBhaca, SiLala, SiNhlangwini ("IsiZansi"), SiNrebele (SiSumayela), IsiMpondro, Khoekhoegowab, !Orakobab, Xirikobab, N|uuki, !Xunthali, Khwedam, KheLobedu, SePulana, HiPai, SeKutswe, SeṰokwa, SiThonga, SiLaNgomane, SheKgalagari, XiRonga and others. 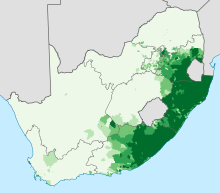 Most South Africans can speak more than one language, and there is very often a diglossia between official and unofficial language forms for speakers of the latter. Dutch and English were the first official languages of South Africa from 1910 to 1925. Afrikaans was added as a part of Dutch in 1925, although in practice, Afrikaans effectively replaced Dutch, which fell into disuse. When South Africa became a republic in 1961, the official relationship changed such that Afrikaans was considered to include Dutch, and Dutch was dropped in 1984, so between 1984 and 1994, South Africa had two official languages: English and Afrikaans. English being the second language of many South Africans is the most widely used lingua franca, and language of secular authority. Many countries from around the world have turned to South Africa for their supply of low cost English and other educators. Different government departments and official bodies use different terms to denote SeSotho sa Leboa ("Northern Sotho"), which is a standardised language largely based on SeKoni and SePedi. In South Africa, Southern Ndebele is known simply as Ndebele, as most speakers of Northern Ndebele live in Zimbabwe. This Northern Ndebele is thus also known as Zimbabwean Ndebele, as it is the language of the Ndebele of Mzilikazi and assimilated groups, including many Kalanga people. However, a third language known as "Ndebele" is the unofficial language previously called, in English, "Northern (Transvaal) Ndebele". This language was, after the Tomlinson Report, classed together with Southern Ndebele, although it is actually distinct as a Tekela language, spoken by the Ndebele of Gegana (Mthombeni), whereas the official language of IsiNdebele is a Zunda language, spoken by the Ndebele of Ndzundza and Manala. Since taking power in the 1994 election, the ANC has promoted English as the main language of government, even if South Africans often take pride in using indigenous languages for any purpose. Afrikaans in its Eastern dialects (upon which the standardised form is based, in a process bringing it closer to Dutch) also features prominently in commerce together with English, as these are the languages associated with the racial hegemony. In terms of linguistic classification, the official languages include these two West Germanic languages (English and Afrikaans) and nine SiNtu languages. Four of these are called Nguni languages (IsiZulu, IsiXhosa, SiSwati and IsiNdebele) and three are Sotho–Tswana languages (Sepedi, SeSotho sa Borwa, and SeTswana). XiTsonga is a Tswa–Ronga language, and TshiVenḓa falls into a group on its own. South African Sign Language is understood across the country, though sometimes sign-language interpreters use manually coded language. Endangered languages include many of the Tekela Nguni languages, such as SiPhuthi or SiBhaca, northern Sotho languages such as KheLobedu, and the Eastern Sotho languages, such as SePulana and particularly HiPai which may be extinct. Critically endangered languages include the Nǁng language, currently only represented by the N|uu dialect (N|uuki), which has at most three mother-tongue speakers, as well as the Southern Khoekhoe languages of !Orakobab and Xirikobab (with the third Khoekhoe language spoken in South Africa being Namagowab). The motto of the Northern Cape Province, Sa ǁa !aĩsi 'uĩsi, is in the N|uu language, and was written by !Uiki Elsie Vaalbooi. This language is the closest living relative of the ǀXam language and ǁXegwi language, now both thought to be extinct. The motto on the coat of arms of South Africa, !Ke eː ǀxarra ǁke, is written in the |Xam language. These so-called "click languages" constitute what was formerly known as the "Khoe-Sān" language family, the members of which are now considered to fall into at least three separate language families: Khoe-Kwadi, Tuu, and Kx'a. The Kx'a language spoken in South Africa, !Xunthali, together with Khwedam (a Khoe-Kwadi language), are the local languages of the population of Platfontein derived from members of the 31 Battalion (SWATF), most of whom were Sān groups originally from Angola, conscripted as trackers during the South African Border War. Dominant languages in South Africa. 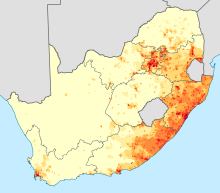 Proportion of the population that speaks an Nguni language as a first language. 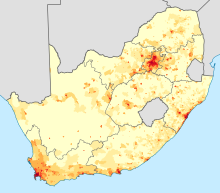 Density of first-language speakers of Nguni languages. The most common language spoken as a first language by South Africans is Zulu (23 percent), followed by Xhosa (16 percent), and Afrikaans (14 percent). English is the fourth most common first language in the country (9.6%), but is understood in most urban areas and is the dominant language in government and the media. 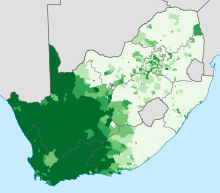 The majority of South Africans speak a language from one of the two principal branches of the Bantu languages that are represented in South Africa: the Sotho–Tswana branch (which includes Southern Sotho, Northern Sotho and Tswana languages officially), or the Nguni branch (which includes Zulu, Xhosa, Swati and Ndebele languages officially). For each of the two groups, the languages within that group are for the most part intelligible to a native speaker of any other language within that group. 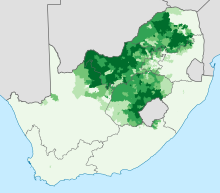 The indigenous African languages of South Africa which are official, and therefore dominant, can be divided into two geographical zones, with Nguni languages being predominant in the south-eastern third of the country (Indian Ocean coast) and Sotho languages being predominant in the northern third of the country located further inland, as also in Botswana and Lesotho. 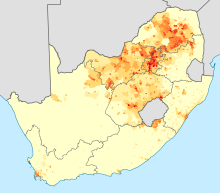 Gauteng is the most linguistically heterogeneous province, with roughly equal numbers of Nguni, Sotho-Tswana and Indo-European language speakers, with Khoekhoe influence. This has resulted in the spread of an urban argot, Tsotsitaal or S'Camtho/Ringas, in large urban townships in the province, which has spread nationwide. Tsotsitaal in its original form as "Flaaitaal" was based on Afrikaans, a creole language derived from Dutch, which is the most widely spoken language in the western half of the country (Western and Northern Cape). It is spoken as first language by approximately 61 percent of whites and 76 percent of those populations who were formerly classified so-called "Coloured" people. This racial term of the Apartheid era is popularly considered to mean "multiracial", as it represents to some degree a creole population, however most of whom are in fact Khoekhoen in heritage, and many (particularly Cape Muslims) are also descendants of slave populations imported by the Veerigde Oostindische Compagnie (VOC) from slaving posts in West and East Africa, and from its colonies of the Indian Ocean trade route. Political exiles from the VOC colony of Batavia were also brought to the Cape, and these formed a major influencing force in the formation of Afrikaans, particularly in its Malay influence, and its early Jawi literature. Primary of these was the founder of Islam at the Cape, Sheikh Abadin Tadia Tjoessoep (known as Sheikh Yusuf). Hajji Yusuf was an Indonesian noble of royal descent, being the nephew of the Sultan Alauddin of Gowa, in today Makassar, Nusantara. Yusuf, along with 49 followers including two wives, two concubines and twelve children, were received in the Cape on 2 April 1694 by governor Simon van der Stel. They were housed on the farm Zandvliet, far outside of Cape Town, in an attempt to minimise his influence on the VOC's slaves. The plan failed however; Yusuf's settlement (called Macassar) soon became a sanctuary for slaves and it was here that the first cohesive Islamic community in South Africa was established. From here the message of Islam was disseminated to the slave community of Cape Town, and this population was foundational in the formation of Afrikaans. Of particular note is the Cape Muslim pioneering of the first Afrikaans literature, written in Arabic Afrikaans, which was an adaptation of the Jawi script, using Arabic letters to represent Afrikaans for both religious and quotidian purposes. Afrikaans, however, originates in the Dutch varieties spoken in Khoekhoe communities of ǁHui!gaeb (the Khoekhoe name for the region of Cape Town), as a trade language before and during the early stages of the VOC occupation. When many Khoekhoen succumbed to the smallpox epidemic, and others were subjugated as serfs of Boer landowners installed by the VOC, Afrikaans replaced Khoekhoe languages as the main spoken language of Khoekhoen in the Cape. It also became the de facto national language of the Griqua (Xiri or Griekwa) nation, which was also primarily a Khoekhoe group. Afrikaans is also spoken widely across the centre and north of the country, as a second (or third or even fourth) language by Black South Africans (which, in South Africa, popularly means SiNtu-speaking populations) living in farming areas. Other languages spoken in South Africa not mentioned in the Constitution, include many of those already mentioned above, such as KheLobedu, SiNrebele, SiPhuthi, as well as mixed languages like Fanakalo (a pidgin language used as a lingua franca in the mining industry), and Tsotsitaal or S'Camtho, an argot that has found wider usage as an informal register. Many unofficial languages have been variously claimed to be dialects of official languages, which largely follows the Apartheid practice of the Bantustans, wherein minority populations where legally assimilated towards the official ethnos of the Bantustan or "Homeland". Significant numbers of immigrants from Europe, elsewhere in Africa, and the Indian subcontinent (largely as a result of the British Indian indenture system) means that a wide variety of other languages can also be found in parts of South Africa. In the older immigrant communities there are: Greek, Gujarati, Hindi, Portuguese, Tamil, Telugu, Urdu, Yiddish, Italian and smaller numbers of Dutch, French and German speakers. The fastest growing non-official language is Portuguese – first spoken by immigrants from Portugal, especially Madeira and later black and white settlers and refugees from Angola and Mozambique after they won independence from Portugal and now by more recent immigrants from those countries again – and increasingly French, spoken by immigrants and refugees from Francophone Central Africa. More recently, speakers of North, Central and West Africa languages have arrived in South Africa, mostly in the major cities, especially in Johannesburg and Pretoria, but also Cape Town and Durban. Chapter 1 (Founding Provisions), Section 6 (Languages) of the Constitution of South Africa is the basis for government language policy. The English text of the constitution signed by president Nelson Mandela on 16 December 1996 uses (mostly) the names of the languages expressed in those languages themselves. Sesotho refers to Southern Sotho, and isiNdebele refers to Southern Ndebele. Controversy surrounds the designation of Northern Sesotho as Sepedi (its main dialect) instead of the comprehensive Sesotho sa Leboa (which had been the wording in the Interim Constitution of 1993). The spelling of Venda is also incorrectly rendered as Tshivenda instead of the correct Tshivenḓa. The constitution mentions "sign language" in the generic sense rather than South African Sign Language specifically. The official languages of the Republic are Sepedi, Sesotho, Setswana, siSwati, Tshivenḓa, Xitsonga, Afrikaans, English, isiNdebele, isiXhosa and isiZulu. Recognising the historically diminished use and status of the indigenous languages of our people, the state must take practical and positive measures to elevate the status and advance the use of these languages. (a) The national government and provincial governments may use any particular official languages for the purposes of government, taking into account usage, practicality, expense, regional circumstances and the balance of the needs and preferences of the population as a whole or in the province concerned; but the national government and each provincial government must use at least two official languages. (b) Municipalities must take into account the language usage and preferences of their residents. The national government and provincial governments, by legislative and other measures, must regulate and monitor their use of official languages. Without detracting from the provisions of subsection (2), all official languages must enjoy parity of esteem and must be treated equitably. (ii) Arabic, Hebrew, Sanskrit and other languages used for religious purposes in South Africa. ^ "Africa :: SOUTH AFRICA". CIA The World Factbook. ^ "South Africa could make signing official language". bbc.com. 28 July 2017. Retrieved 19 April 2019. ^ Alexander, Mary (6 March 2018). "The 11 languages of South Africa - South Africa Gateway". South Africa Gateway. Retrieved 12 March 2018. ^ "Documents - Constitution - Republic of South Africa Constitution Act 110 of 1983". Info.gov.za. 15 October 2004. Archived from the original on 24 February 2014. Retrieved 10 January 2014. ^ "Latest News | Department Of Arts and Culture" (PDF). Dac.gov.za. Archived from the original (PDF) on 9 March 2012. Retrieved 10 January 2014. ^ "The 11 languages of South Africa - South Africa Gateway". South Africa Gateway. 6 March 2018. Retrieved 12 March 2018. ^ a b Census 2011: Census in brief (PDF). Pretoria: Statistics South Africa. 2012. pp. 23–25. ISBN 9780621413885. ^ "Portuguese Migration to, And Settlement in South Africa: 1510-2013" (PDF). SSIIM (UNESCO Chair on the Social and Spatial Inclusion of International Migrants – Urban Policies and Practices). 10 May 2013. Retrieved 27 August 2018. ^ "Constitution of the Republic of South Africa Act 200 of 1993". www.gov.za. Retrieved 6 December 2014. ^ "Constitution of the Republic of South Africa, 1996 - Chapter 1: Founding Provisions". www.gov.za. Retrieved 6 December 2014. This page was last edited on 19 April 2019, at 13:27 (UTC).